Mostly unexcavated, the Chacchoben ruins (Zona Arqueológica de Chacchoben) make up the largest and most visited Maya archaeological site in Costa Maya. Here moss-covered temples sprout from a lush jungle, attracting visitors who want to learn about Maya history, including the collapse of the ancient civilization. Located about 110 miles (177 kilometers) south of Tulum, the Chacchoben ruins site includes two main temple pyramids, which date from 200 BC to AD 700, plus a third, smaller pyramid. After the collapse of the Maya civilization, it’s believed that Chacchoben remained a ceremonial center, with rituals continuing to take place at the temples. Eventually, the site was completely abandoned. In 1942, a Maya man discovered the site, and it now serves as a popular destination for day trips from Cancun and the surrounding cities. Because the Chacchoben ruins are a popular half-day shore excursion for cruise ship passengers, many tours depart from near the Costa Maya port. Those staying in Cancun can take full-day Chacchoben tours that include a visit to nearby Lake Bacalar, called the Lagoon of Seven Colors. For those venturing to the ruins on their own, on-site guides are available for personal tours. Since the ruins are mostly unexcavated, visitors should wear sneakers or hiking boots, not flip-flops. Mosquitos may be abundant, especially during rainy season, so remember to bring insect repellent. Keep your eyes open for deer, peccaries (piglike animals), armadillos, gray foxes, and spider and howler monkeys, which inhabit the surrounding jungle. The Chacchoben ruins are about a 50-minute drive from the Costa Maya port, which is located right outside the village of Mahahual. Typically, tours include transportation to and from the ruins site. Keep in mind that public transportation is not always reliable. If traveling from Cancun, Playa del Carmen, or elsewhere on the Riviera Maya, head south along Mexico Highway 307 until you reach Chacchoben; the trip takes about 3.5 hours. In order to avoid the crowds, visit the Chacchoben ruins early in the morning or later in the afternoon. In the early morning hours, you’ll have a better chance of sighting exotic birds and spider monkeys. During the rainy season, which occurs from May to December, the ruins may be off limits or under cover for protection. 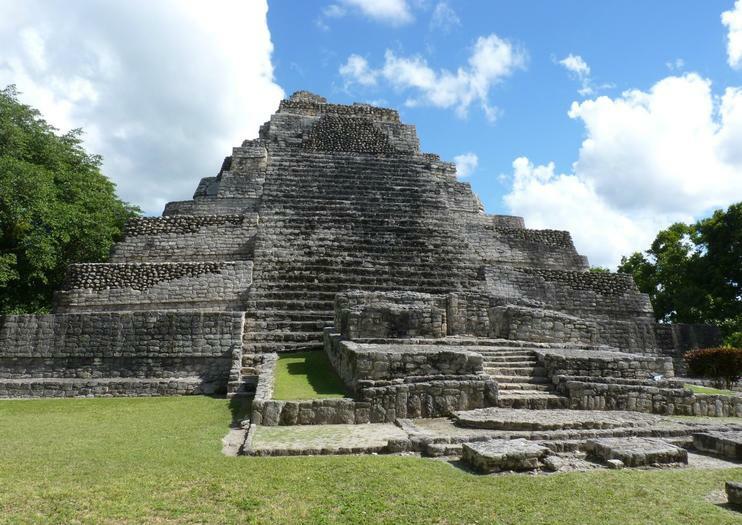 In addition to Chacchoben, the Costa Maya contains two other archaeological sites—Dzibanche and Kohunlich—both of which are located about two hours from Mahahual and roughly 35 minutes apart. Ruins tours exploring both sites are available and are also popular shore excursions for cruise ship passengers. These sites aren’t as heavily visited as Chacchoben, so you can explore Maya ruins without as many crowds.